Bud Light goes one step above Heineken’s Walk-In Beer Fridge with “Bud Light House”, a whole house made of Bud Light cans of beer. 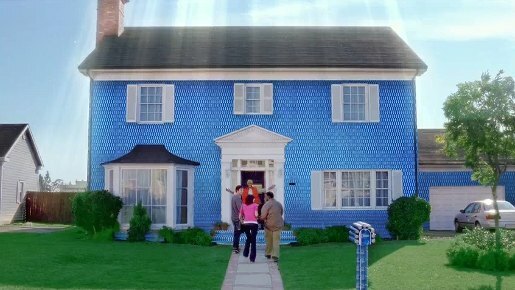 The spot, shown during the 2010 Super Bowl, shows a man inviting his friends to his new abode. What at first seems to be environmentally responsible recycling turns out to be a novel way of hosting a party. The Light House ad was developed at Cannonball, St Louis, by creative directors Steve Hunt and Mike Binnette, copywriter Brian Fauss, art director Joe Bishop, producer Bob Jackson, broadcast production manager Mary Jarnagin, account director Cori Wilson, account directors Cori Wilson and Doug Wilson. Filming was shot by director Michael Bigelow via Gartner, Santa Monica, with director of photography Sal Totino, executive producer Rich Carter, line producer Helen Hollien. Editor was John Devries at School with executive producer Sarah Brooks. SPFX were produced at AXYZ FX by SPFX supervisor David Giles, executive producer Irene Payne. Graphics sequence was produced at 90 Degrees West. Colorist was Billy Ferwerda at Notch. Sound and music were produced at Pirate Toronto by director Vanya Drakul and Chris Tate, producer Joanne Uyeyama. Casting director was Ross Lacy at Ross Lacy Casting.